"Once all the noise is quieted, it's amazing what has room to make itself noticeable. I had so many revelations in that space..."
Reiki is a gentle and powerful balm for the mind, body and spirit. Stepping into the practice of Reiki for one's self and others puts this healing balm in your hands at any time, and for your whole lifetime. It can, if you choose to follow it further, open up pathways to deeper levels of spiritual exploration (See below for more info on Reiki and my practice). In this Shoden Reiki 1 (first degree) training you will receive all that you need to develop a vibrant and fulfilling Reiki practice for treating yourself and others. It provides a direct experience to begin unraveling the mystery of your own True Self. This training will be deeply experiential, intuitive and embodiment-based. Our teaching draws heavily on the deep roots of Reiki in Japanese Buddhism. You will emerge from it as a certified Reiki I Practitioner. 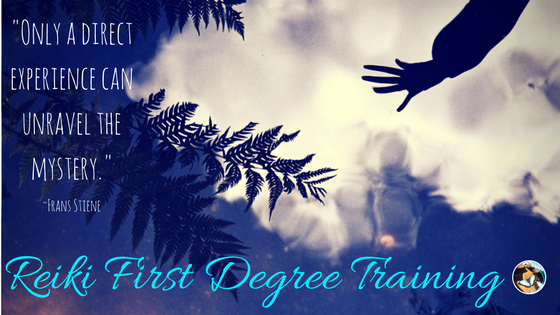 The initiations, protocols and hands-on practice for offering full Reiki treatments to others. Grounding in the principles and practice of Reiki. Exploration of the double-cloaked history of Reiki, its fascinating, unlikely pathway to the West, and its relevance to a vibrant modern Reiki practice. Certification as a Reiki I Practitioner. Monthly Practitioner Group: Gatherings that support your personal practice, and service opportunities to bring Reiki to the larger community. Re-immersion (review trainings): Students are always welcome to review a training when space in the class permits, and deepen their experience. Re-immersions are offered on an optional donation basis. Donations are added to our scholarship fund. Treatments: When class size permits, students may attend the treatment portion of a class and give/receive sessions at no charge. This class is limited to 10 participants to ensure time and space for hands-on practice. You must register using the form below. Reiki Shoden is offered at a sliding scale. The actual cost of the class is $225. Tickets listed below that price are discounted and are limited. Select a discounted ticket if paying the full price would represent a hardship for you. **A $50 deposit, or full payment, is required upon registration. Payment plans are available; see registration form for payment methods. Deposit is fully refundable up to 7 days prior to class. Within 7 days from class, the deposit can be transferred to a future class. Reiki is a spiritual healing art with its roots in Japanese Buddhism, Shintoism and martial arts, developed in the late 1800's by Mikao Usui. It is a subtle and effective form of energy work that is incredibly sweet and gentle as it loosens and releases pain, emotional blocks and undesired energy trapped in the body. Practicing Reiki leads us to a greater understanding of what healing really is. It is complimentary to other forms of medical or healing work, and can support physical, mental and spiritual health. Reiki encourages a person's body and spirit to release anything that no longer serves, and that's ready to release. Just as pouring cool water through a dusty pipe washes away loose dust and debris, Reiki washes through a person's system and loosens up pain, negative emotions and energy blocks, re-energizing the system towards remembering the wholeness of your true self. Particularly supportive during pregnancy, times of injury or illness, or times of transition. Taught by Michaela Daystar and Joe Gee. Michaela is a HeartScapes Weaver, committed to supporting you to lean into your full self and connect more deeply with your identity and purpose. Joe serves as a wisdom integrator, committed to helping you remember the wholeness of your True Self. As Master Teachers of the Usui system of Reiki, we have received the initiations and training from teachers in a direct lineage from Dr. Mikao Usui, founder of the Reiki system of healing in the late 19th century. Dedicated to teaching Reiki from the Japanese foundation, sharing this teaching is a privilege and a delight. What invisible thread did you follow that drew you to Reiki? Reiki Shoden is offered at a sliding scale. The actual cost of the class is $225. Tickets listed below that price are discounted and limited. Select a discounted ticket if paying the full price would represent a sacrifice or hardship for you. **Pre-payment is required. Payment is fully refundable up to 7 days prior to class. Within 7 days from class, payment is refundable minus a $50 fee, or can be transferred to a future class.